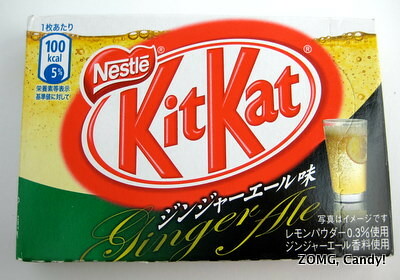 Leave it to the Japanese to decide that Ginger Ale would make a good Kit Kat flavor. I’d read reviews of Ginger Ale Kit Kats on other sites, but it sounded so weird that I still really wanted to try one for myself. Lucky for me, there was one in my free sample box from Tsunami.hk. 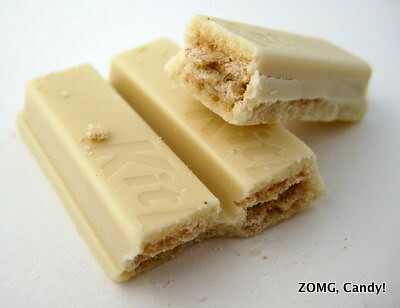 The Kit Kat was a yellowish white chocolate. It smelled exactly like soda, though I thought the scent was more citrusy than gingery. I’d say more like Sprite or Fresca than ginger ale. The bars’ outer white chocolate coating was super soft and melted in my fingers. It tasted of overly sweet white chocolate with a hint of citrus. Most of the “ginger ale” flavor lay in the cream filling sandwiched between the crisp wafers. It tasted weirdly sour and effervescent. Every once in a while, there was a sharply piquant crystal of sour lime flavor. I wasn’t a fan of the combination of white chocolate and citrus and effervescence. The whole thing had an awful finish that I found off-putting.